My post last Monday about basic demographic figures only being indicative of possible futures, not determinative of them. This does not mean that numbers are not important. Taken from here, this chart shows the effects of differential population change over the 1950-2100 period, using United Nations data from 2010. The site's summation merits sharing. A glance at Wikipedia's list of the populations of the countries of the world over time confirms this. In 1950, the United States' 151.9 million would have been outnumbered two-to-one by the 68.4 million of Germany, 50.1 million of the United Kingdom, 47.1 million of Italy, 42.5 million of France, and 28.1 million of Spain. Looking outside of the North Atlantic area, there were barely more Brazilians than there were Britons and Italians, war-devastated Poland's 24.8 millions comfortably outnumbered Egypt's 21.9 million inhabitants, the Netherlands had 30-40% fewer inhabitants than Canada or South Africa, Singapore had barely a million residents, and the populations of the smaller Persian Gulf states were measurable in hundreds of thousands or even tens of thousands. Europe's populations grew absolutely, and quite substantially, but declined relative to the rest of the world as the demographic transition took hold, with greater effect owing to the superior medical technology and sharply reduced infant mortality available in our time, as opposed to a century ago. This decline manifested even relative to other high- and middle-income continents and countries. On Tuesday, Slate noted that day was "Pi Day", that shortly after 2:29 pm Eastern Standard Time United States Census Bureau's population clock hit 314 159 265--"pi times 10 to the eighth", as Slate notes--according to a press release. On that day, it should be noted, the five European countries that together outnumbered the United States two-to-one sixty-two years ago now lead the United States by just a couple million people. Soon, these five countries' lead will disappear; soon, the United States will lead. Looking at the simple crude metric of total population says nothing about other, arguably more important factors, like (say) age composition. 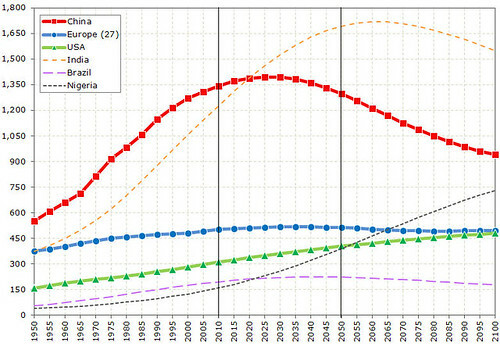 (To name a single example, Nigeria is going to be so much younger than China in 2050.) By themselves, these population totals don't mean anything. It's imaginable that Nigerian economic weight wouldn't equal its demographic weight, arguably likely given its problems and current leadership. But having a population on the order of China's and Europe's, and younger than either, makes the chances of such growth that much more likely. I really don't think Nigeria will ever obtain the population that is projected based on simple extrapolation of present trends. There is no way that 750 million people will be able to feed themselves in Nigeria. Such projections ignore real limiters on human population growth, that of food and water. And of course as population pressures increase, war, disease, will play an increasing role to bring things back into balance. Real life is much more than trend lines. In reply to anonymous... I also am skeptical that the population could get to 750 million and by supported by the land in Nigeria... but I'm also skeptical that anything like famine or war could avert it. WWII only killed 60 million worldwide, the largest famine of the 20th century was perhaps the Chinese one during 1960 or so, and only killed at maximum about 40 million. I just don't really see something even that big likely to happen in a country such as Nigeria which has oil and is, though corrupt, not closed off from the rest of the world in trade. And it looks like it would require disasters on a much *larger* scale than anything we are familiar with to even slow down the demographic trends a little bit. It's complicated by the fact that Nigeria is only a quarter the size of India, so 750 million on that land is already double India's maximum density and it looks like the trend is still just going up at 2100, and it's neighbors are also growing quickly. I have no doubt it would be seriously in excess of the local sustainable population. But, local overshoots of carrying capacity are completely possible, and we just don't have any examples of how a modern country's demographics might be derailed by war or famine-- really the only things that seem to have any effect on this scale are social changes in the expected family size. @jemand: There is a plausible Malthusian equilibrium: one where the population is perpetually under-nourished, causing especially high death rates among infants and greatly reducing women's ability to conceive and carry pregnancies to term (and also increasing their risk of dying). Plus everyone has a weak immune system, so epidemics hit much harder. This was basically the state of play throughout the world in pre-industrial times. If you're looking for historical examples of sudden spikes in mortality, forget wars and famines. They pale into insignificance compared to the numbers killed or effectively taken out of the reproductive pool in the great pandemics. You don't even need to go far back in history - look at what AIDS has done to southern Africa's demographics, for instance. Colin, which nations do you mean? I was looking at a few and it seems to me that only Zimbabwe don't have very high recent population expansion rates. Even the ones hit hardest by Aids, still seem to have pretty strong exponential growth. And I don't really know if Zimbabwe's slowed growth is due to any sort of demographic shock on the order of war/disease/food pressures etc., or if it just has a different social structure which has decided to have fewer children, i.e., demographic transition. There are obviously huge problems with population projections on this time frame. Climate change, robots, social mores ... you get the point. Anonymous appears to making a basic error. Countries can trade. What matters is whether the world can produce enough food to feed the world population in 2100, not whether any particular country is self-sufficient. That is, I think, Jemand's point: I'm just making it more directly. Self-sufficiency, by the way, has many advantages, but averting famine is not one of them. @Colin I think that history has shown repeatedly that people who predict a coming population disaster are wrong. Malthus was wrong and people were wrong in the 1960's when they predicted there would be massive food shortages. The thing people always forget is that technology advances much faster than population grows and that always provides an answer to our problems. In the 1960's we had the green revolution that allowed us to produce enough food to feed more people than anyone ever thought possible. Also the ability to ship food from regions of excess (the United Status or Russia for example) to regions of scarcity (like Nigeria) shouldn't be overlooked. This is a great article. It think that the comment about power shifting away from the West and towards Asia and Africa is spot on. By sheer virtue of demographics Asia and Africa will increase in importance. If you look at the countries that have been doing the best economically it is the developing countries with a young and growing population. The developed countries with aging and declining populations have been struggling economically (mainly Europe and Japan). Without a growing consumer base eventually you reach a point that you can't grow any further. Then once a countries ratio of dependents to workers gets to high they begin to run into debt problems. The only way out is to increase the population. Unfortunately most of Asia appears to making the same mistakes as the West and has a sharply declining birth rate.